Wonderful day for a winter walk. 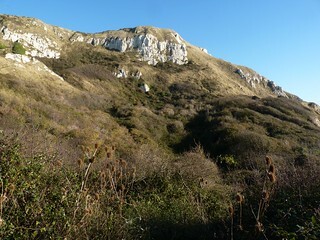 This is the hard way to White Nothe from Ringstead. Fortunately I was walking down not up. The public right of way, known locally as the smugglers' path, is not visible in the foreground. However, you can just make out where I had come from - to the right of the main chalk outcrop, at about one o'clock in the photo.